For years I fed my fears and insecurities. I allowed those fears to dictate my actions. I remember plenty of times giving up on things or not even trying for lack of confidence and the fear of failure. The truth is that had I tried I know today that I would have succeeded. Had I not allowed those fears to interfere with the natural flow of things. I would have overcome. Instead I fed those fears and allowed them to continually grow until failure was my only option. (In my head). I quit before I got out the gate and as a result became accustomed to not trying, not giving my all and not believing in myself. I am learning to face my fears today. There are times when I still entertain thoughts of failure but they do not dictate my actions and keep me paralyzed today. They are but a passing thought and a fleeting feeling. I do not dwell there and give them the opportunity to grow to that point anymore. 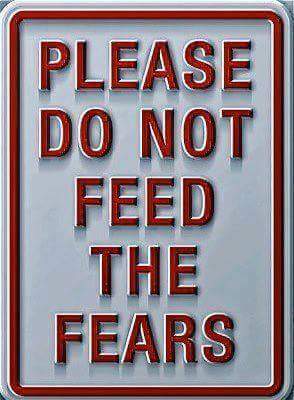 I have learned that my fears are not facts and they can either help me grow or they can stunt my growth. Well I choose growth. I will not feed that monster inside me that longs for failure and tries to keep me locked in my self made prison. I will not allow that part of me to grow and take back the control it once had over me. Today I feed my faith and belief that I can do anything I put my mind to. And Its working. As a addict I have experienced the pain, loneliness and despair of addiction. Before coming to the fellowship I tried everything in my power to control my usage of drugs. Nothing I ever tried worked. I tried switching my drug of choice, I tried lying to myself by saying I would only do 1. I tried hiding my money or asking someone to hold it for me. I even went as far as to leave money in my locker at work so I would not spend all of it, only to go to the job and get what I had stashed there. No matter what I tried, how many different approaches, techniques, plots and schemes they all failed. My addiction was to aggressive and I would cave in to the cravings every time. No matter what I tried in the end my addiction lead me to a downward spiral every time. Slowly but surely the progression would get worse until I was back at rock bottom. I have learned by working some steps about the mental and physical affects of my addiction. Mentally I would become obsessed with thoughts of using. I would be thinking about using day in and day out. I would be thinking about what I was going to do when my drugs ran out long before they actually ran out. I would plan on Sunday how much of my money would go to buying my drugs when I got paid on Friday. I couldn’t last a minute without thinking of using and finding ways and means to get more. I was totally obsessed and consumed with it and my life reflected that. Then there is the physical aspect of my addiction. The compulsive urges to continue using even when I knew the end results would be devastating. Regardless of the consequences or repercussions I continued to use. They say that insanity is doing the same things expecting different results, well my insanity reached the 100th power because I did the same things knowing the results and did them anyway.There is also a spiritual aspect of addiction and that is the self centeredness. You see no matter what happens its all about me, what I want and how I feel. I want what I want and I want it now. I have hurt a lot of people along the way with my selfishness. But in reality is was my addiction not the real me that had me in its grips. I had no control over it or my actions. I didn’t know anything about the affects of my disease until I came into recovery and started to do step work. I always thought that I was a normal person and the things I did were normal too. I thought I was pretty smart and that all I had to do was stop using drugs and everything was going to be ok. I have learned that I was wrong about that and many other things I thought that I knew. I never thought of myself as being powerless or unmanageable. I thought that surrender was for suckers, quitters and losers and I always thought I was in control of every situation. I had to learn that by surrendering to the disease of addiction and admitting my powerlessness and unmanageability that I would be able to grow and not only learn how to stay clean, but also learn that addiction is about much more than just drugs. Once I stopped using and had a clear mind I began to realize that my addictions started way before I ever picked up my first drink and drug.I began to see that my life had been unmanageable and I had been powerless long before I ever used any substance. Growing up I had addictions to lying and stealing and they only grew as I got older and began to experiment with drugs. I was always trying to control situations even at a early age only to find out now that I have no control over others actions only over how I respond to them. I can tell you how much of a shock that was to me, and I still didn’t believe it even though all the proof was staring me right in the face. I have always been a hard head and one you had to prove things to. 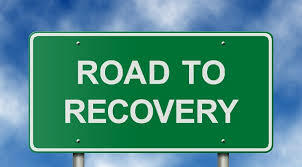 I was the same way in my early recovery and as a result I relapsed time and time again. Today I know better and once you know you cannot go back to not knowing. I am grateful for the process of step work. Just by answering some simple questions honestly and openly I have learned a great deal about myself and why I have done some of the things I did. I am learning who I am and how to accept the things I am learning without acting out. It is a process that is saving and changing my life on a daily basis and I will be forever grateful. I have the opportunity to live the life I was meant to live. I am in the process of doing things I used to only dream of and it is an amazing journey. I share my experiences with you all in the hopes that I might be able to help someone who might be struggling with the same things I struggled with. I am here to share hope. A message of freedom from active addiction. That an addict, any addict. 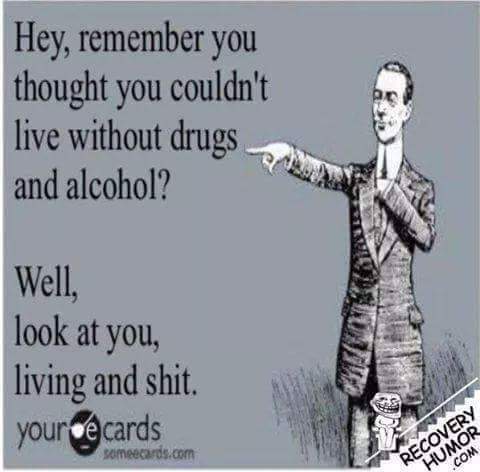 Can stop using drugs, lose the desire to use and find a new way to live. I can’t tell you the difference in me today compared to 10, 5 even 2 years ago. The proof is in the way I live. http://bible.com/116/gen.50.20.nlt You intended to harm me, but God intended it all for good. He brought me to this position so I could save the lives of many people. I used to be miserable, unhappy about everything. 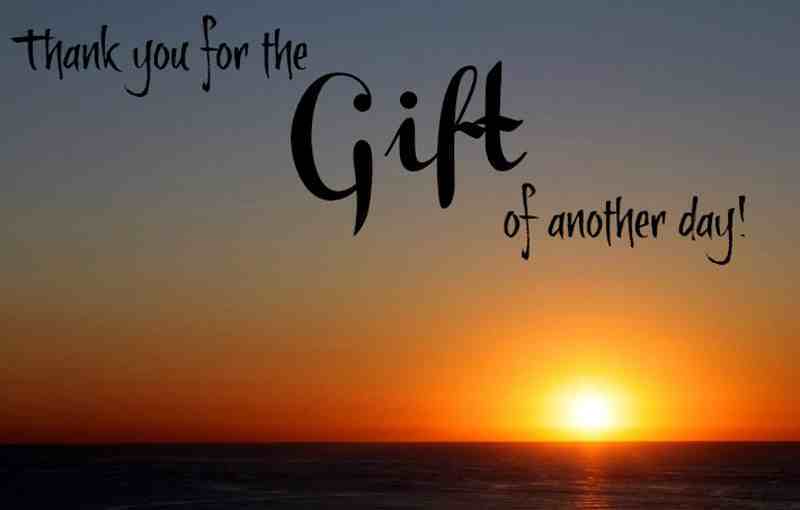 I would complain about everything that was wrong with my life and had no gratitude for the things that were right. I always thought that the world did me wrong and that everyone owed me something. That was a very sad state I was in. I have learned that the world didn’t do anything to me. That I was not wronged by anyone other than myself. The chip on my shoulder that I carried for years was placed there by me and I chose to carry it every where I went. Me and nobody else. I am responsible for my own happiness. No one else can fulfill that which is inside of me. I have to stand up for what I want and not try to manipulate others into doing things for me. Relying on someone else to make me happy is a unrealistic expectation and I will be disappointed EVERY TIME. I cannot buy, steal or borrow happiness. It is a feeling and a state of being that I must achieve on my own by practicing some spiritual values. Some of which I choose are Honesty, Willingness, Acceptance, Faith, Openness, Love, Gratitude and Service to others. I must be grateful for what I have and not be consumed by what I do not. Good morning everyone. I am grateful for another day alive and clean. 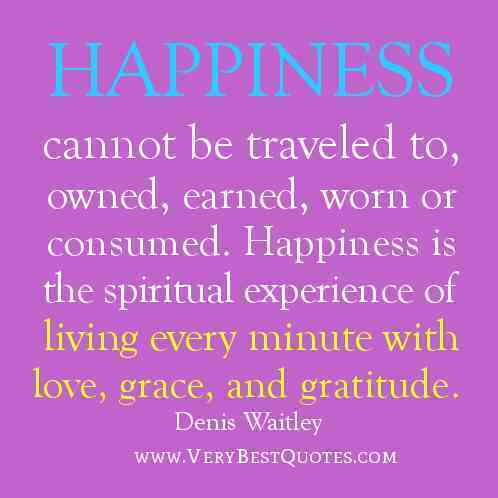 Today I will continue practicing gratitude. Have a fantastic day and remember. 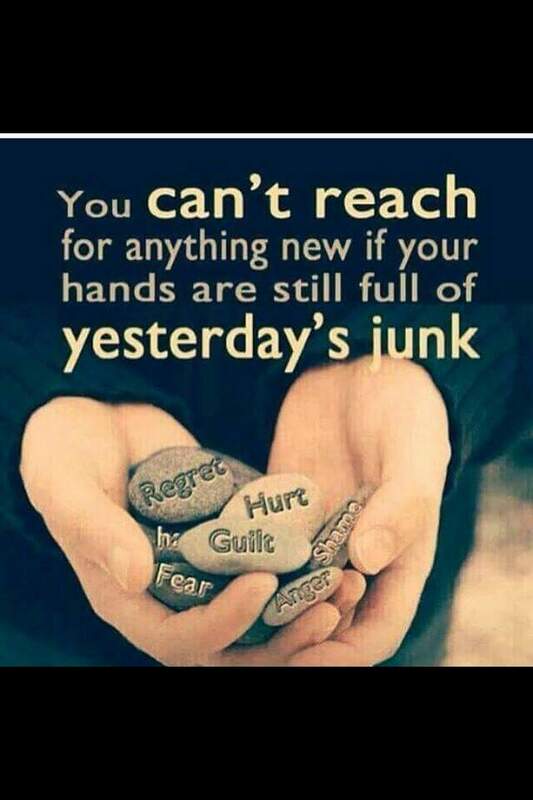 I continue to actively participate in letting go of yesterday’s baggage. That allows me to make room for today’s blessings. Today’s a great day. Man do I remember the pressures of trying to live up to others expectations of me. I also remember the disappointed feelings when I didn’t measure up. Failure became the only way of life. It was “The Norm”. At least that way I didn’t have to worry about pressure any more. That kind of thinking eventually led me to believe that I was worthless, hopeless and a complete and utter failure. I wouldn’t even make a wholehearted attempt anymore. I was feeling defeated before I even started. My self esteem was so low that children had higher hopes. I was lost and alone. Today I am totally the opposite. I am happy, joyous and free. My self esteem and self worth are climbing and I no longer feel lost, lonely or defeated. I have purpose today. I do not try to live up to other people’s expectations of me. I also do not place unrealistic expectations on myself. I am allowed to live my life today, One day at a time. Without the worry or pressure. Living in the moment has given me a freedom I have never experienced before. 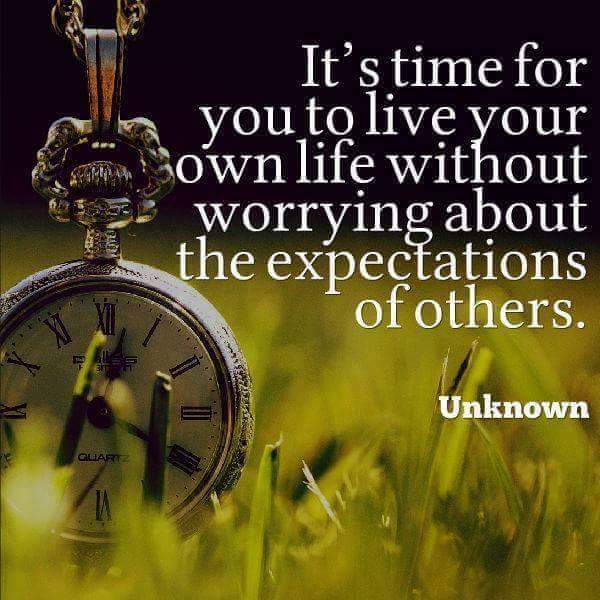 I will not let others expectations of me dictate my life or my actions today. When I think back to my active addiction I remember I used to act off my thoughts without concern of the consequences. I would have a thought pop into my head and before long the thought turned into action. I wouldn’t be able to shake that thought until I did something about it. Obsession that over powering desire to use even when I know it is destroying my life. When I say use It not only has to do with drugs. Using anything to much. People, places and things are all included. Compulsion. The inability to stop using once I have started. I am never satisfied and I will continue the behavior regardless of the consequences until I get what I want and even then continue. It is part of my cycle of insanity. 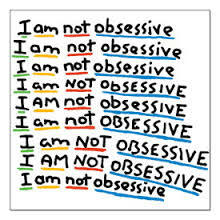 I still suffer from obsession and compulsion even in recovery. It can manifest itself in many different ways from eating to smoking cigarettes to being obsessed with my thoughts and actions about people. It can be detrimental to my health and well being and if not checked can cause some major damage and have serious repercussions. Obsessions are hazardous they can make me do things and act out in ways that are irrational. I have a program today that helps me sort through my madness but even with a program my addiction (my thinking) can still wreak havoc. I have to remain vigilant and be sure to talk about the things that run through my mind. Its always good to run certain things by another person just to make sure my irrational thinking is not a back door insanity trip. I am grateful for my process and my network.